A PORTION OF THE PROCEEDS OF THIS GAME GO TO THE MARINE CONSERVATION PROGRAMS OF THE PARTICIPATING ORGANIZATIONS. Escape to Fiddler Island, an online paradise where feisty crabs help you build your sand towers and castles! Placing blocks might seem easy at first, but WATCH OUT…Mother Nature and other surprising obstacles are not going to make it easy for you to reach your height goal. First stop, Tropical Beach! Watch out! Sneaky sea turtle hatchlings try to take your blocks out to sea with them, but you can stop them by spraying them with water. When the water spray has been used enough times, the baby sea turtle is washed happily out to sea. “Pirate” sea gulls entangled in trash try to knock down your castle, but you can help free them by launching sand dollars, Ice rocks, fire rocks and key limes at them! The sea gulls are never hurt as each impact just knocks off more trash until the gull is free and flies off content. Earthquakes, wind and giant beach balls also work to prevent you from reaching your goals.. If you want to just enjoy building the castle of your dreams, you can always go to Sandbox Beach…and when you’re done, save or send a picture of your favourite castle to a friend! 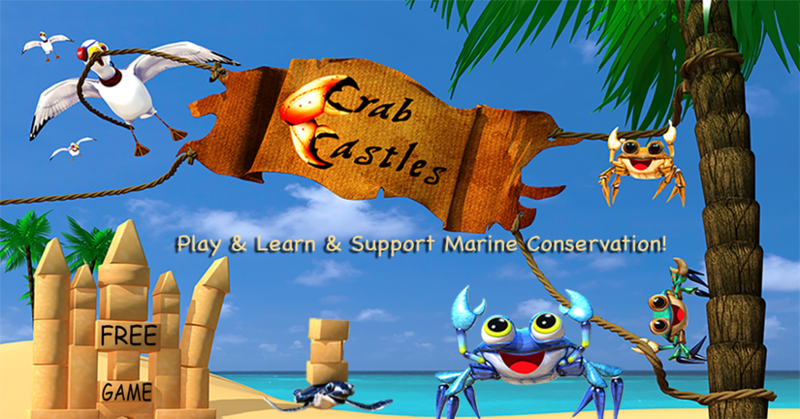 When you’re playing Crab Castles, without really knowing it, you’ll be learning lots about crabs, marine life and ocean conservation...and the best part is, part of our advertising and in-app purchases revenue go to the marine conservation programs of our participating organizations. Be a player in making a better world! Crab Castles© 2013 by Arts Technology Laboratories, LLC, Crab Castles® ArtsTechLab® All rights reserved.